Learning to fly fish the different types of water currents is a fundemental necessity to catching fish. The upstream mend is a basic technique used when working between the faster and slower currents of most any river or stream. 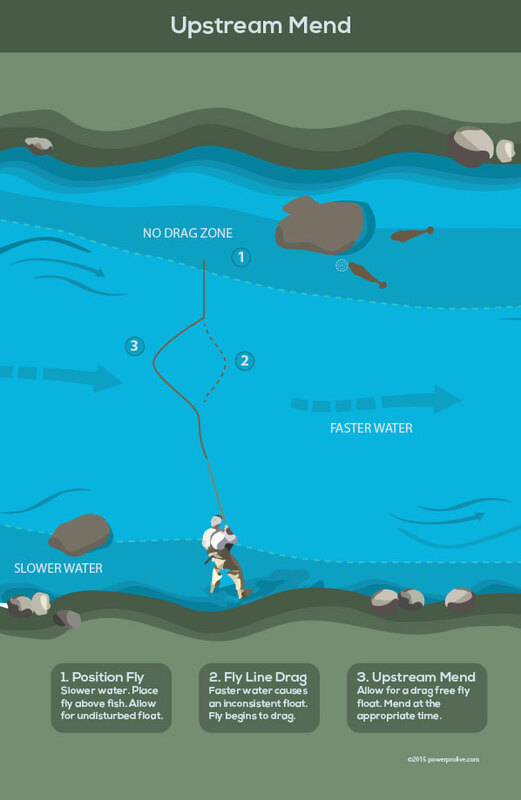 Learn how to spot tricky waters and cast to rising fish without a drag. Catching fish consistently with a fly rod is all about how you control your fly and ultimately your fly line. Enter the river’s currents into this conversation. Understanding or "reading" the river is of prime importance so you can judge the parts of the water that are moving fast and slow. The next time you look at the surface of a river, notice that the current is not uniform from bank to bank. Different parts of the river move faster or slower than others. 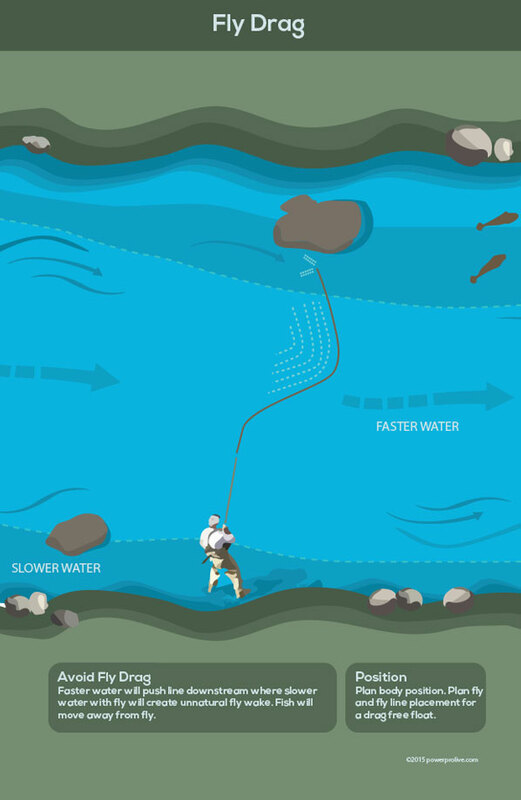 Problems arise for fly fishermen when they have to cast across currents of different speeds. Have a look at the illustration below, the current near the bank is slower than the current in the middle of the river. If you want to cast to the opposite bank from where you’re standing, your line will lie across the faster current, while your fly sits in the slower current. Because the fast current will take your fly line downstream ahead of the fly, the line will drag the fly behind it, creating a wake and ruining the dead drift. The "Upstream Mend" is the perfect technique for removing drag in the line. As we've said, drag in the line causes your fly to float unnaturally. Fish see the fly's wake and they sense something isn't right and move on to their next meal. The basic upstream mend is used to remove tension in a tight fly line. Once you've practiced the technicque and know the appropriate place to place your mend, you'll throw the line upstream and achieve a drag free float. A mend is nothing more than a flip of the rod tip or series of flips with the rod tip that puts a horseshoe shaped bow in the line. This slows the speed with which the line travels if mended upstream and speeds up the line if mended downstream. 1. Mend as soon as the fly touches down, before the line has time to bond to the water’s surface. This will help you avoid dragging your fly under. 2. Begin the mend with your rod tip close to the surface of the water. If you have a bunch of slack hanging from your rod tip, all you’ll end up moving is the slack, not the line on the water. You may have to make a couple of quick strips to pick up this slack before you mend. 3. The hinging point, where the mended line meets the unmended line, should occur at the seam between the different speed currents. If you don’t mend enough line, the current will cause the line to drag the fly; if you mend too much line, you can accidentally pull your fly out of the trout’s feeding lane. 4. Lift your rod tip high, even over your head, during the mend. This will allow you to pick up more line and to avoid dragging the line across the water. 5. Mend with authority. A half-hearted mend rarely moves enough line. You’ll probably over-mend the first few times — accidentally throwing your fly upstream with the line — but with some practice, you’ll learn just how much power is needed to move the line you want to move without disturbing the fly. Plan your body position relative to the appropriate cast technique, practice mending and you'll be more successful fly fishing on the river. An upstream mend is a powerful tool however, once the fly is moving faster than your line, you'll need to mend downstream. Watch for future fly fishing articles on downstream mending in the near future.